PATH Intl. welcomes back Platinum Performance as its 2013 lanyard sponsor. Thank you, Platinum Performance! PATH Intl. Center membership packets for 2013 are being mailed this week. Watch your mailbox for your packet containing your 2013 center membership certificate and other information. If you don't receive your packet in the next 10 to 14 days, please contact Karen Province as your renewal may have been incomplete. If you received notification that your center membership renewal was missing items, your packet will be sent as soon as the missing items are received. 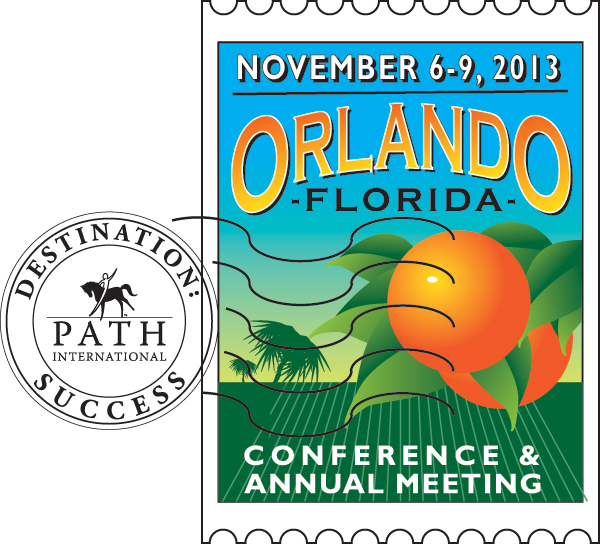 On behalf of the association, thank you and welcome for another year to PATH Intl. membership. By renewing its membership, your center continues to be part of a thriving community of dedicated professionals who seek credentialing, learning and mentoring with a shared goal being the advancement and success of your organization. The American Quarter Horse Association is offering young riders a great opportunity to star in a new web-based video series. The videos about young riders and horses will be featured on Take Me Riding, a new digital platform designed to interest young children in horses and encourage them to ride. Take Me Riding is seeking child actors with riding experience to star in the series. The ideal candidate is 9- to 13-years-old with experience in major roles in theater camps, school plays or local dinner theater productions. Click here for information. Exceptional Equestrians of the Missouri Valley, Inc., a PATH Intl. Premier Accredited Center in Washington, MO, hosted a series of therapeutic riding lessons that were part of a recently published study, "Equine Assisted Activities and Therapies: A Case Study of an Older Adult," conducted by Lisa Wehofer, Nicole Goodson and Tim L. Shurtleff of the Program in Occupational Therapy at Washington University School of Medicine in St. Louis. Charla Shurtleff, COTA, AHA Level II Therapist and PATH Intl. Advanced Instructor, led a series of 10 riding sessions with an older adult participant in order to explore the use of EAAT in improving balance, postural sway, fear of falling and participation in older adults. She found that therapeutic horsemanship can improve the quality of life for older adults outside of the riding arena. Turn your center volunteers' passion into action by having them recognized as an EQUUS Foundation Champion! To become a Champion, an individual must log a minimum of 24 volunteer hours from January 1st to December 31st. The volunteer hours will be verified by the organization and The EQUUS Foundation. Once Champion status is achieved, volunteers should continue to log their hours throughout the year as benefits are still under development that involve rewards for the quantity of service. Click here to learn more about the Champions program and to sign up. Welcome to New PATH Intl. Centers! PATH Intl. welcomes the following centers, which joined in March 2013. PATH Intl. Centers have access to grant information through the Foundation Directory Online (you must be signed in to access the directory). The Foundation Directory Online is the premier online resource for grant research providing a user-friendly searchable database of over 98,000 grantmakers.